DOM stands for Document Object Model. When a browser loads a web page, the browser creates a Document Object Model of that page. The HTML DOM is created as a tree of Objects. 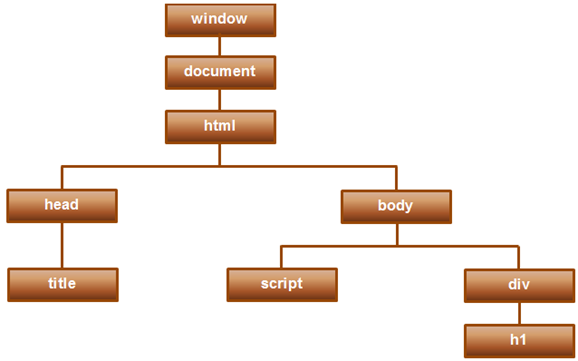 For the above HTML a graphical representation of the Document Object Model is shown below. We will continue with the same examples that we worked with in Part 36. Notice that in this case, we are assigning event handlers using the DOM object properties (onmouseover & onmouseout) instead of using the attributes of the HTML tag. We are using this keyword to reference the current HTML element. In this example "this" references the button control. The following example is same as the above. In this case we are assigning an anonymous function to onmouseover & onmouseout properties. If an event handler is assigned using both, i.e an HTML attribute and DOM object property, the handler that is assigned using the DOM object property overwrites the one assigned using HTML attribute. Here is an example. Using this approach you can only assign one event handler method to a given event. The handler that is assigned last wins. In the following example, Handler2() is assigned after Handler1. So Handler2() owerites Handler1().